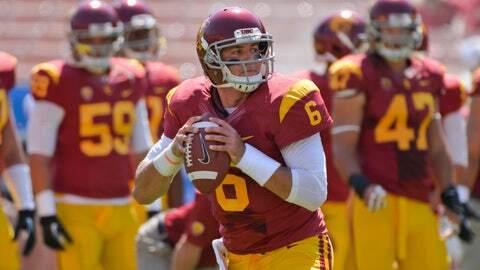 For the third season in a row, quarterback Cody Kessler enters spring ball in some type of quarterback battle. Where will Josh Shaw line up? Josh Shaw’s return to cornerback was just what the doctor ordered for the USC secondary in 2013. If there was a blemish in the USC defense under Clancy Pendergast last season, it was at cornerback. Shaw helped shore things up there. Keeping him at corner could have a similar impact on this season’s group. The wildcard could be Chris Hawkins, who certainly looked like a viable contributor at corner last season as a redshirt. With an opportunity for playing time now, he could crack the lineup. Is Nelson Agholor ready to be true No. 1? 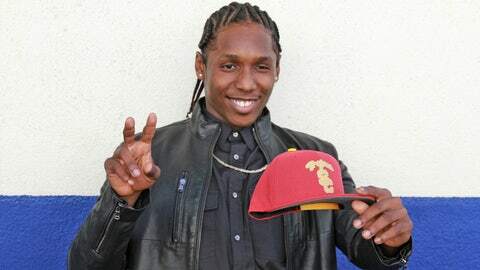 The Marqise Lee era is officially over at USC. The 2012 Biletnikoff Award winner didn’t have a Marqise Lee-type season in 2013, but his production was still good enough to lead the team in catches. After studying under Robert Woods and playing in the shadow of Lee last season, the stage is set for Agholor to take a significant jump from his breakout 2013 season. He showed the ability to be able to break games open when he returned two punts for touchdowns last season at Cal, setting a conference record. Last season he led the team in receiving yards and touchdown catches. He enters spring practice as the legitimate No. 1 option for Cody Kessler or whomever the starting quarterback ends up being. Can Cody Kessler win another QB battle? At this point it has to be commonplace for Cody Kessler. For the third season in a row, he’ll enter spring ball in some type of quarterback battle. As a redshirt freshman he battled Max Wittek for the right to be Matt Barkley’s backup. Last spring it was the beginning of Kessler vs Wittek II. This spring, Kessler is the incumbent and back to compete for the position though competitors around him have varied. No longer is Wittek in that mix after electing to transfer out of the program. Redshirt freshman Max Browne and true freshman Jalen Greene, an early enrollee, will be in the mix to try to unseat Kessler to run the new offense under first year head coach Steve Sarkisian. What will the USC offense look like? 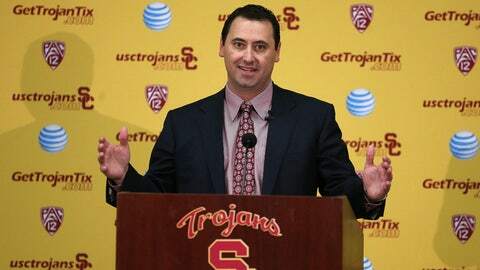 Steve Sarkisian has made it clear, he did not bring a spread offense with him to USC from the University of Washington. He calls it a pro-style system run in an uptempo fashion. Offensive coordinator Clay Helton has marveled at some of the concepts and says he’s interested in seeing the fusion of the two different worlds. He’s not alone. USC fans are eager to see just what exactly the product on the field is going to look like next fall. Here’s what we know: coaching the reigning Mackey Award winner, Sarkisian’s offense makes good use of the tight ends. Bringing in the likes of Tim Drevno off of the Jim Harbaugh coaching tree, a power running game is to be expected. Can Sark restore the glory of USC? The prospective candidates were a who’s who of college football coaches from across the country. Once the dust settled, USC decided to replace Lane Kiffin with his BFF. Friends off of the field, Sarkisian and Kiffin are not the same on it. Sarkisian is probably more Pete Carroll in personality than he is Kiffin. In fact, it was Carroll who offered a huge token of support while he was still the head coach at USC, privately campaigning for Sarkisian to be his successor. It didn’t work out, but following a five-year run at the University of Washington, Sarkisian is the head man at USC. He’s opening practices, at least in the spring, to the first 200 fans to show up to watch from the baseball field. Sarkisian won’t be hiding injuries, and he says he won’t make references to the numbers USC doesn’t have in scholarship numbers. 2014 marks the last season of scholarship restrictions and Sarkisian has a tall order, taking over a program that won 10 games while playing for three different head coaches in 2013.